Are e-cigarettes really healthier than normal cigarettes? The first commercial e-cigarette was released in China back in 2004 and over the next few years they would make their way across the US and into Europe, primarily being sold on small on-line stores. The initial reception wasn’t great and after listening to the suggestions and opinions of vapers worldwide, more modifications and tweaks were made to the design to give us the varied and customisable e-cigs we have today. Ever since they were first released for public use, e-cigarettes have been under scrutiny as to whether they really are a ‘healthier’ alternative to traditional cigarettes. 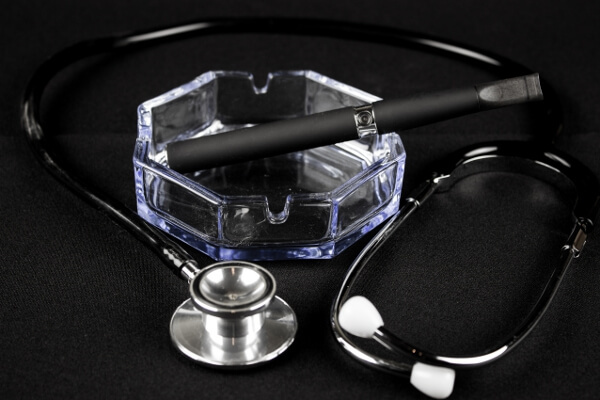 Health organisations around the world claim that there is not enough evidence to firmly state that e-cigarettes are better for you than cigarettes, so let’s have a look at what we do know. When smoking a normal, tobacco cigarette, the smoker inhales a number of different chemicals as well as tar. Tar is present in all traditional cigarettes, however it is not included in e-liquids. This is definitely better news for the health of your lungs. As for chemicals, there are usually only around 4 main ingredients in a bottle of e-juice, glycerin, which is organic and found in a lot of fruits and vegetables, propylene glycol, which is often found in asthma inhalers (this is also why e-cigarettes are not recommended for people with asthma), food flavouring and nicotine. In traditional cigarettes, you’ll find hydrogen cyanide, carbon monoxide and formaldehyde, along with a whole host of other terrible chemicals. Why do people still argue against e-cigarettes? Research into the long term effects of e-cigarettes is still in its early stages, currently, there are a lot of tests that bat back and forth the idea that e-cigs are healthier than normal cigarettes, but nothing concrete. It’s this lack of concrete evidence and continuing studies that consistently throws the claim that e-cigs are a better alternative to smoking, into disarray. At the beginning of 2016, it was announced that the NHS were planning to hand out e-cigarettes as a valid way to quit smoking. E-cigarettes were already suggested as a way to give up cigarettes on the NHS website, along with a number of different suggestions such as nicotine patches, medication and nicotine gum. It wasn’t until 2016 that the NHS made the suggestion that they should prescribe e-cigarettes to those desperately needing to quit smoking. According to the NHS UK website, e-cigarettes have been found to be 95% less harmful than traditional cigarettes. A review conducted by Public Health England found that, not only has the number of e-cigarettes sold increased over the last few years, but when used correctly, e-cigs pose no risk of nicotine poisoning. According to Public Health England, e-cigarettes pose no real threat to bystanders, unlike cigarettes that have been proven to be harmful through passive smoking. However with an increasing number of public establishments and UK councils banning vaping in all of the same spots as regular smoking, it’s unclear as to what the future of vaping is. Studies continue to be run around e-cigs and for now, it has been proven that they do indeed help those looking to make the difficult decision to stop smoking.